A back channel between Jared Kushner, a White House adviser, and Moscow was proposed to discuss Syria, but never pursued, in the weeks before Donald J. Trump’s inauguration. So why is the following story the lead at the Times? 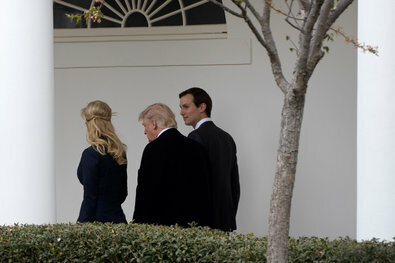 President Trump with his daughter Ivanka and son-in-law, Jared Kushner, at the White House in March. President Trump arrived home Saturday to face reports that his son-in-law is under scrutiny in inquiries into possible ties between Russia and associates of Mr. Trump. It appears that the facts don't fit the narrative of collusion with the Russians, but the media is rolling out the story to continue its efforts to distract the administration and put it on the defensive. The alleged meeting to discuss the proposed back-channel was also well after the election. The facts that have been revealed do not support the contention that this story is some kind of crisis. Not stated in the lead is the illegal nature of the source of this story which evidently came from NSA transcripts of the Russian communications which by their very nature would have been classified. I suspect the purpose of this story is to continue a media narrative that the Trump White House is under siege.